Anti-establishment politics, that is, little support for political institutions and having affinity with far-right parties, is noticeable across European democracies. The rationalist approach has been most dominant for explaining political trust, arguing that differences in political competence and countries’ democratic performance underlie educational disparities in politi-cal trust. Yet, many accounts point to the importance of anti-elitism for understanding anti-establishment politics. In this study, I theorize and test a cultural approach. This approach underlines that the political establishment’s culturally progressive attitudes permeate the in-stitution it represents and that the public, and among it particularly those who have least af-finity with these culturally progressive values, perceives this as cultural superiority signaling by the political elite. They will, in turn, mock and ridicule the political elite for its perceived claims of cultural superiority. 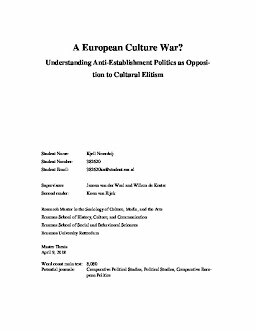 As a result, support for anti-establishment politics in Europe can be understood as a deeply-rooted cultural conflict, a European culture war, where the pol-iticians’ cultural progressiveness is perceived as cultural superiority signaling which the less-er-deemed ‘cultural inferiors’ resist. My study fulfills three goals. 1) Most importantly, I in-troduce and empirically test a novel cultural approach to support for anti-establishment poli-tics. 2) At the same time I systematically test the rationalist approach against this novel framework 3) as well as empirically assess its scope by applying it not only to political trust, but far-right affinity as well. To this end I perform multilevel linear and logistic regression analyses using the European Social Survey, enriched with country-level data and expert sur-vey data (Chapel Hill Expert Survey, Eurostat, the World Bank Group, and the Corruption Perceptions Index). The results of my analyses suggest that reasonable evidence for a Euro-pean culture war exists. My study finds more far-right affinity in countries where cultural elitism in party politics is more pertinent as well as little support for political institutions among those with least affinity with the culturally progressive attitude of the elite, especially in countries where party politics is characterized by cultural elitism more strongly. The ra-tionalist approach’s hypotheses are largely corroborated for support for political institutions, while this approach fails to predict far-right affinity. I conclude with recommendations for future studies that should explicate the limitations found for both approaches as well as the extent in which political competence constitutes a mark of elitism itself. Keywords sociology of culture, sociology of media, sociology of the arts, Support for political institutions, far-right politics, elite-public linkage, cultural elitism, cor-ruption.